Scroll down to see how msnbc.com readers are coping with the rough winter, and click here to send images from your neck of the woods. 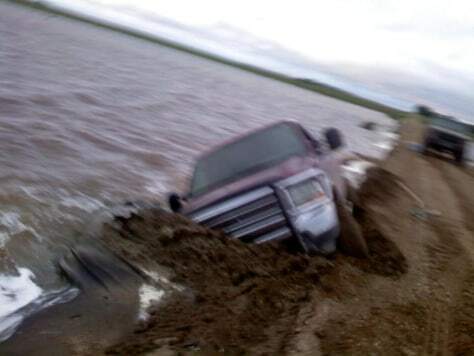 For 18 years Devils Lake of North Dakota has been flooding. In the last 10 years it has gotten critical, swallowing one town completely (Churches Ferry), one town that is half under water, and water and sewer systems failing, potentially resulting in a town relocation. Another town (is) going through a "buyout" because the water table is so high basements are flooding and personal sewers are failing. All while the government has no intention of releasing any water or doing anything but bottling up flood waters. 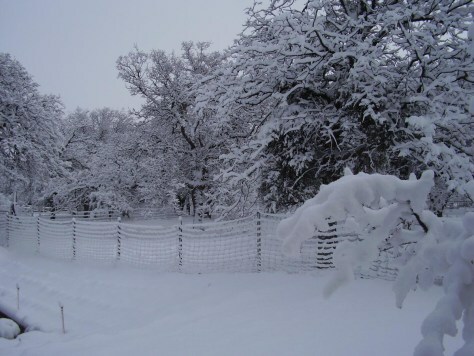 This picture was taken about 9:00am on 2/26/2011 in Tehachapi, Ca., on some of my in-laws property. --Submitted by Neal Hall, Tehachapi, Calif. 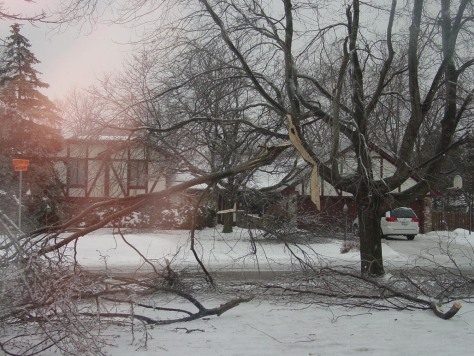 The morning after the ice storm that hit Michigan, February 21. 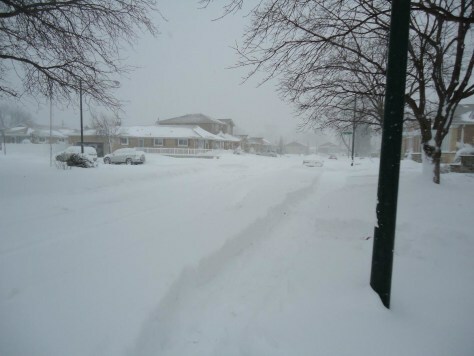 This picture was taken in the early afternoon of February 21, 2011. A friend and I were visiting the Minneapolis Sculpture Gardens to take some photos when I saw this man sitting on a bench. The way he was framed by the arch overhead was just beautiful. 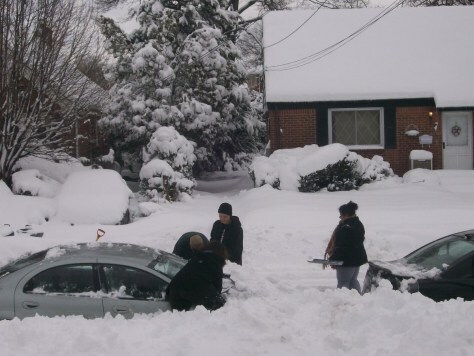 The area received 19 inches of snow over two days. --Submitted By Danyelle Long, Bozeman, Mont. 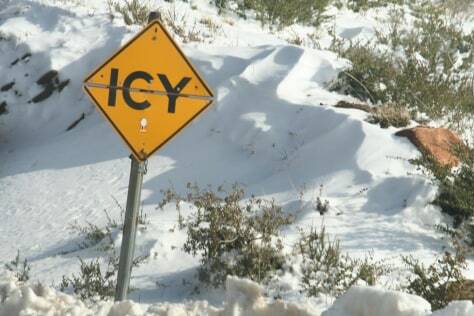 A blanket of snow covers Julian, CA, for a fun filled winter for the locals. --Submitted by Rebecca Jones, Santee, Calif.
Last Sunday morning, our small village woke up to an accumulation of overnight snow. As I came out of my home, I saw the church next door. The snow was beginning to fall from the roof as the sun came out. 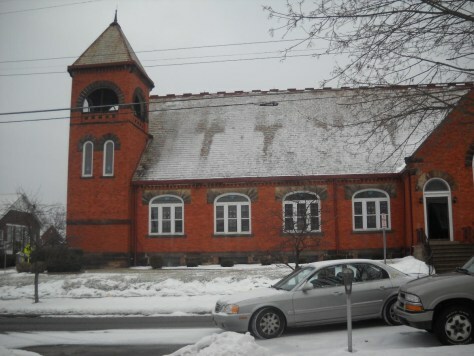 Strangely, as the snow fell from the roof it left images of crosses on this 150+ year old church. 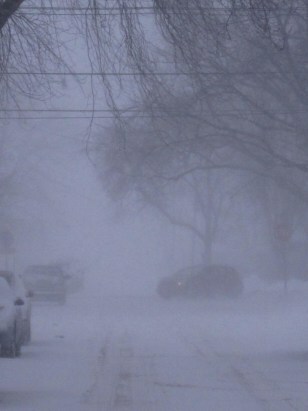 Taken during February 1-2, 2011, blizzard in Chicago suburbs. 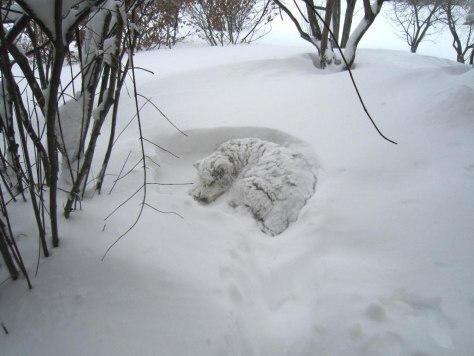 Male alaskan malamute takes nap; perfectly comfortable in the nest he's created. 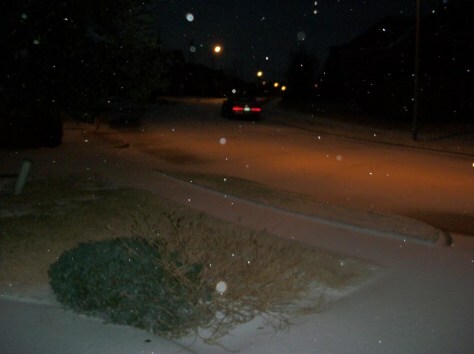 --Submitted by Stanley Heller, Barrington, Ill.
First time in a long time in Dallas, Texas, that we actually get real SNOW. 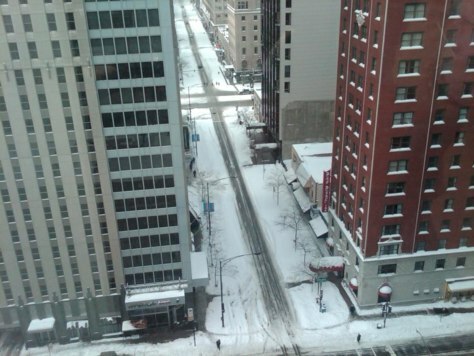 It's usually a mess of mix ice/sleet/rain/hail--but never snow. We received real fluffy snow today ") My hubby's mustang was excited about that. Pictures were taken Feb. 6th in the morning ... Snow Day for us! East Dallas,Texas - by White Rock Lake area. We all met on street and decided to bring out the champagne, about 12 neighbors joined us in the celebration ... no work, only play. Arkansas Snow! 12in so far and another 8in possible on the way! --Submitted by John Brunner, Rogers, Ark. Dallas has never seen such beauty, and heartbreak for cancelled flights coming to the Super Bowl. Oh, maybe we can get some cheap tickets.....Really sorry.....but yeah! 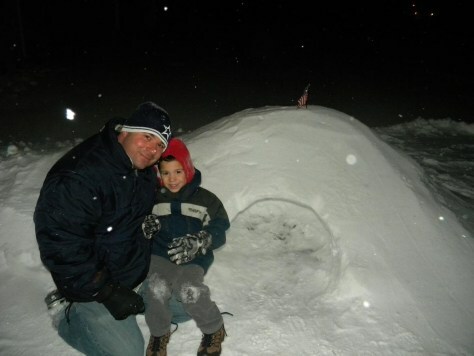 Video: Blizzard captured in 29 seconds by Andy Wastak of Algonquin, Ill.
--Submitted by Frank Tiemann, Long Grove, Ill.
My Kids in the igloo we made after the blizzard of 2011. 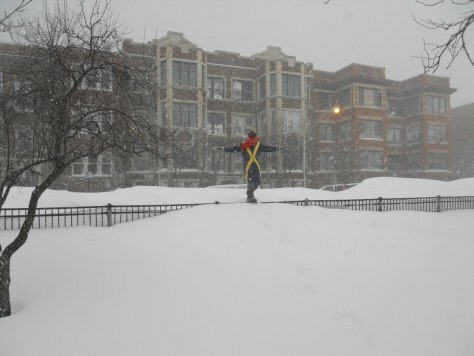 --Submitted by Joanna Marrero, Chicago, Ill. 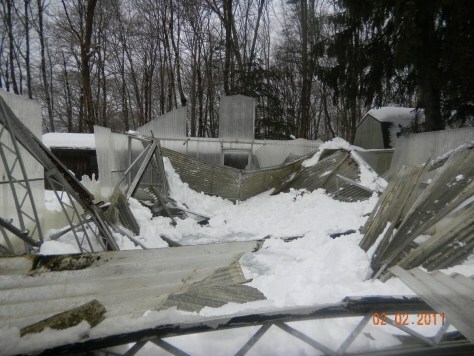 The inclosure to our indoor pool collaped under the weight of the snow and ice that we've gotten over the past few days. 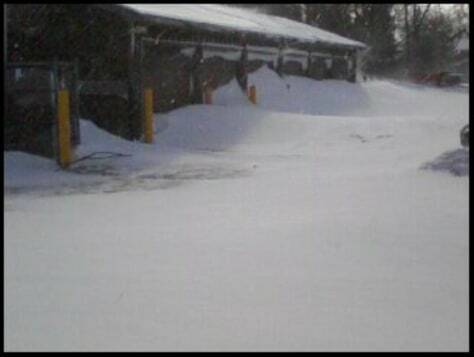 --Submitted by Carly Bergeron, Oakdale, Conn.
A large drift blocking our garage door. 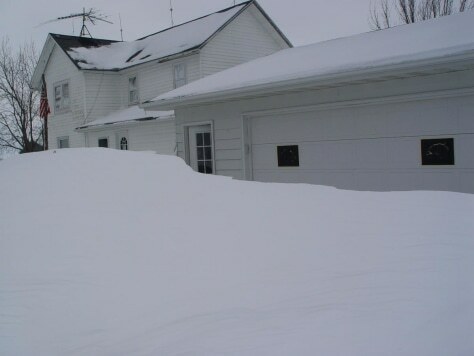 We live on a farm and our house was completely drifted in this morning. It took some digging to get out. 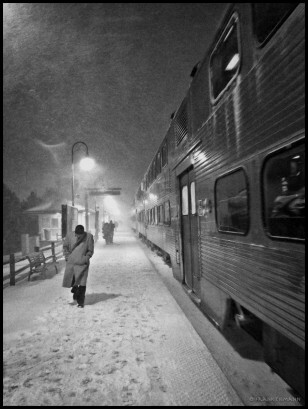 --Submitted by Jim Cook, Racine, Wis. 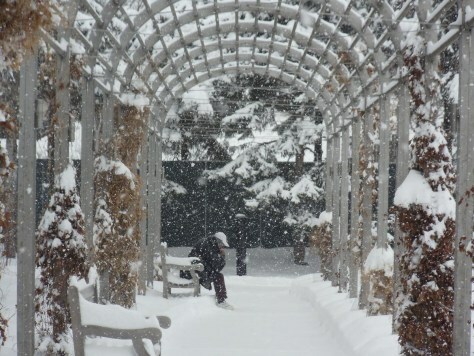 Some images that I took today amid the aftermath of the blizzard of 2011. 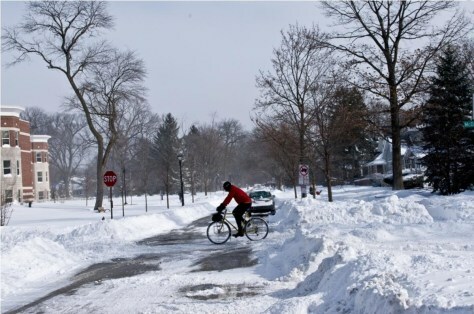 --Submitted by Ivan Silverberg, Skokie, Ill.
Tuesday afternoon. The optimists put their trash out for pick up. 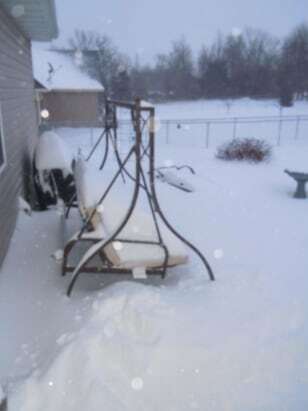 --Submitted by R. Keuchel, Pleasant Hill, Mo. 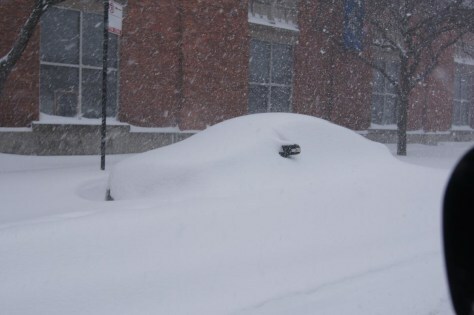 Taken around noon on Feb 2, 2011, in the aftermath of the blizzard that hit the Chicagoland area. My daughter and I ventured out into our neighborhood. We live down a cul-de-sac in a small community in the far northwest suburbs of Chicago. Because there is so much snow, the snowplow drivers kept getting stuck and simply gave up trying to clear our little road. 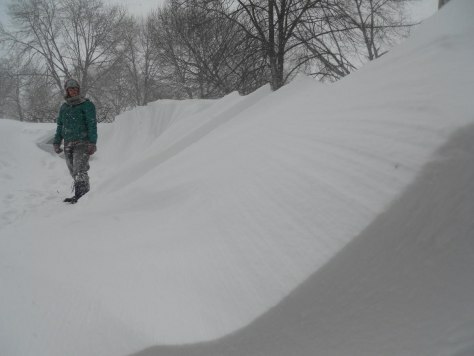 We found snow drifts up to six feet high. 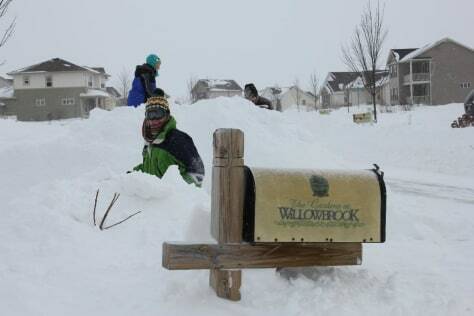 --Submitted by Robin Henn, Hawthorn Woods, Ill. 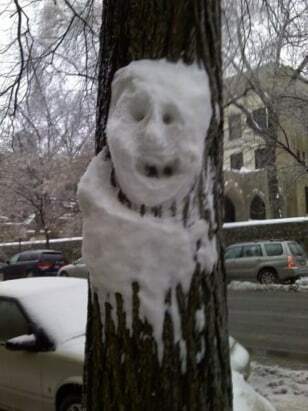 It snowed for 26 hours in NW Indiana. 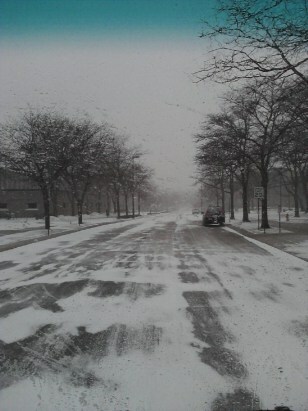 We got the superstorm and then lake effect from Lake Michigan. --Submitted by Tim Alexander, Crown Point, Ind. We were counting down the days until the first day of spring when we were temporarily sidetracked by the monster blizzard! 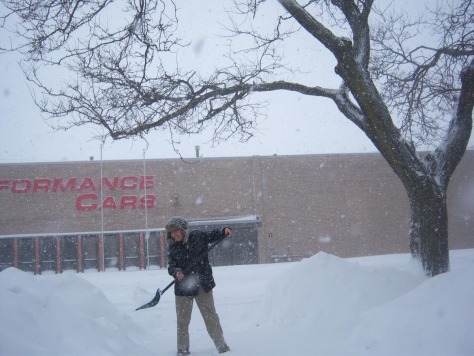 --Submitted by Amanda Minogue, Naperville, Ill.
We need a big zamboni! Ice boats on Lake Kegonsa. 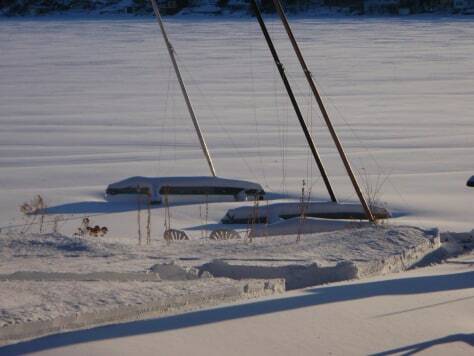 --Submitted by Tim Reid, Stoughton, Wis.
How do you get out? 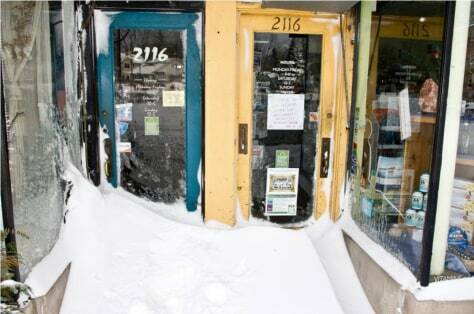 Snow up to waist levels. 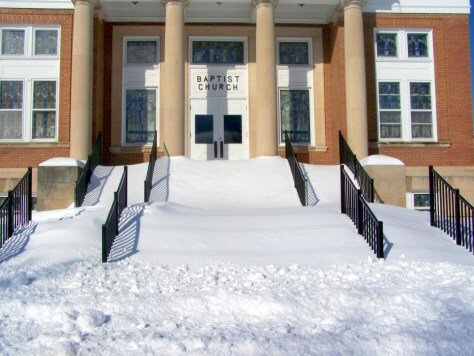 --Submitted by Tim Reid, Hanover Park, Ill.
2nd Baptist Church, Bowling Green. --Submitted by Carl Ulrich, Bowling Green, Mo. 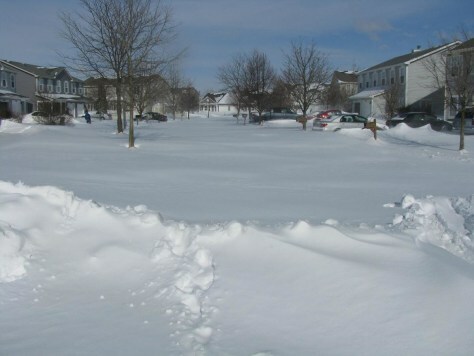 This photo was taken this morning (Feb 2nd) in Beavercreek, OH. We had a lot of ice build up during the course of the day and the large trees just couldn't handle the weight much longer. There looked to be about a 1/2" layer of ice coating everything. While checking on neighbors without power last night I could hear the very eerie sound of icy limbs crashing down throughout the neighborhood. No one can leave their house. 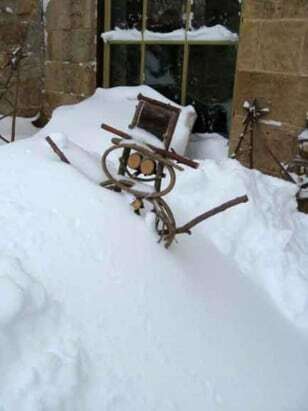 --Submitted by Luke Gotfryd, Naperville, Ill.
--Submitted by Gary Kantz, Gurnee, Ill.
--Submitted by Dianne Goldman, Glenview, Ill.
Woke up this morning to about 3-4 feet of snow at the front door of our art gallery in downtown Mineral Point, Wisconsin. This little rustic snowman was right at home. 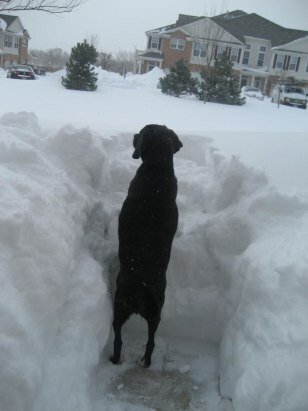 --Submitted by Judith Sutcliffe, Mineral Point, Wis.
My daughter, Mia, trying to find the bottom of the snowdrift! 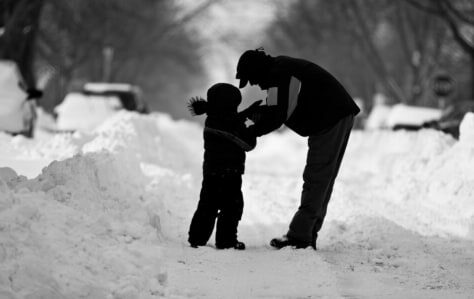 This was my daughter, Mia, in our backyard the morning of the snow storm when it hit the Tulsa area. She couldn't resist! That drift ended up doubling in size. 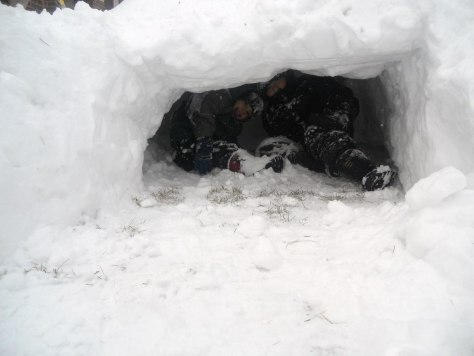 Our backyard is now filled with kid-made "snow caves". 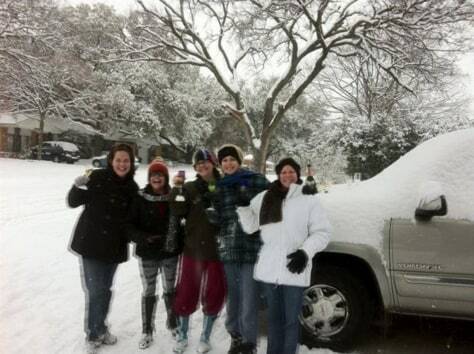 Tulsa got record-breaking snow accumulation, and my kids are loving every second of it. 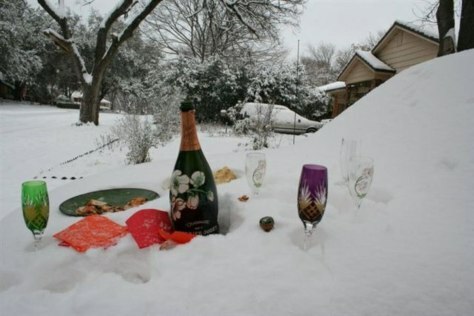 --Submitted by Lora Gambino, Tulsa, Okla. Snow drifts blanket Grand Haven, a small town on the shores of Lake Michigan. 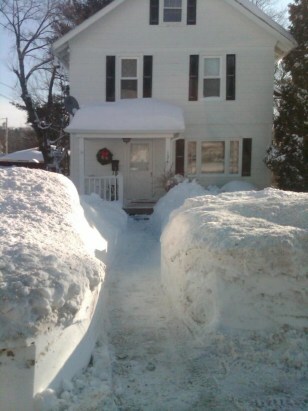 --Submitted by Joe Rotonda, Grand Haven, Mich.
My mom's house in Waterbury, CT. This was taken by my brother Brian Boniecki on 1/28. He was trying to clear away the snow before getting more yesterday and today. Rock Chalk! 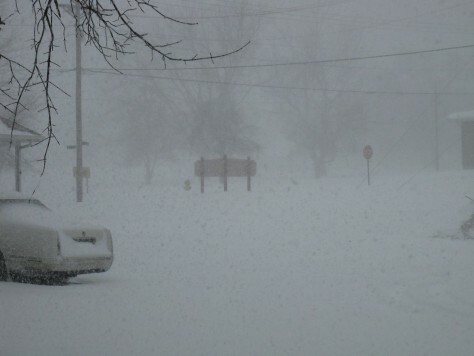 KU's Lawrence, KS, campus, about 9:30am Tuesday 2/1. I felt like the Omega Man. 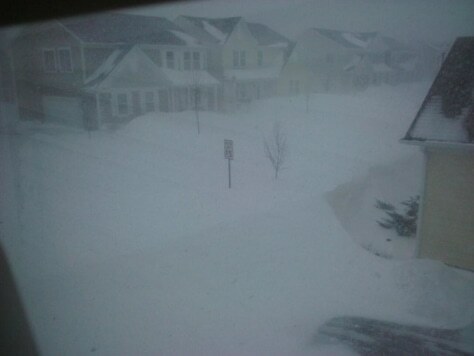 --Submitted by Aileen Dingus, Ottawa, Kan.
After the streets had been plowed & with the winds, we have approximately 3 foot drifts as of this morning. 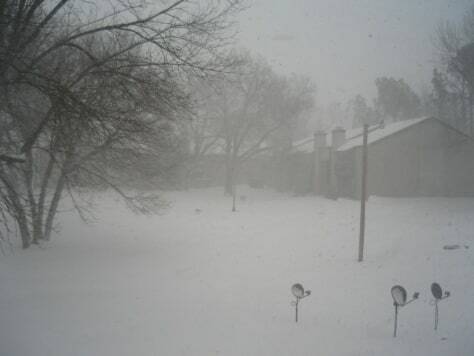 --Submitted by Amanda Heintskill, Thiensville, Wis.
Portage, Indiana; At about 1:45 pm. 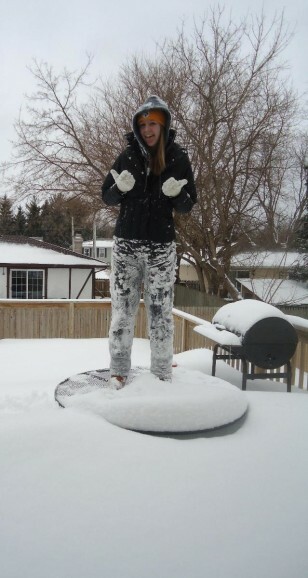 This is me standing on my table outside. As you can see it's covered to the TOP in snow. 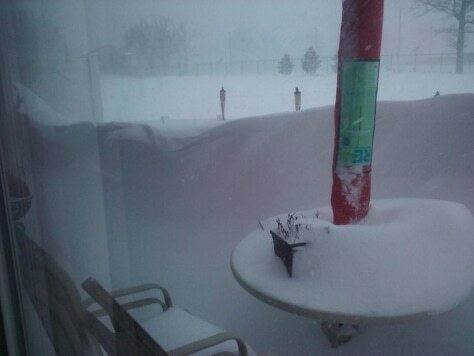 -Submitted by Josi Auksel, Portage, Ind. "Dad, how am I supposed to poop/pee in that"? 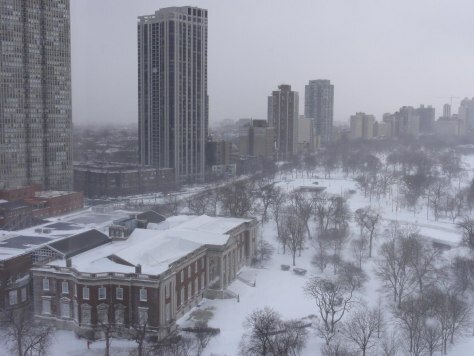 --Submitted by Raul Garcia, Schaumburg, Ill.
View from 14th Floor at 211 E. Ontario St (Northwestern Memorial Hospital) at noon on 02-02-11. The garage where my car is being held hostage. 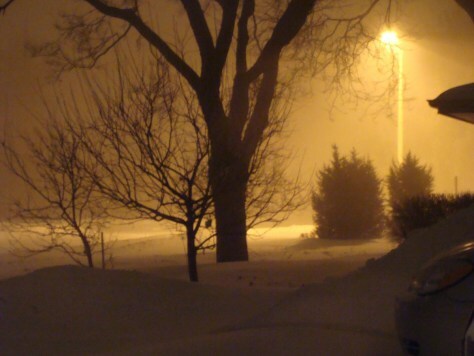 --Submitted by Tricy Bingham, Waukegan, Ill. 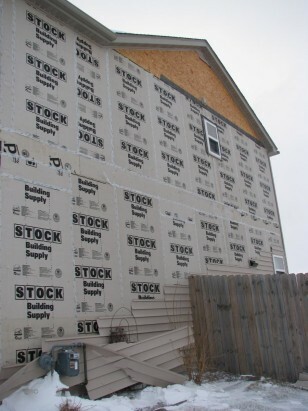 The siding on the entire side of the house was blown off last night from the winds. Taken in Madison Wisconsin this morning after the sun came up. 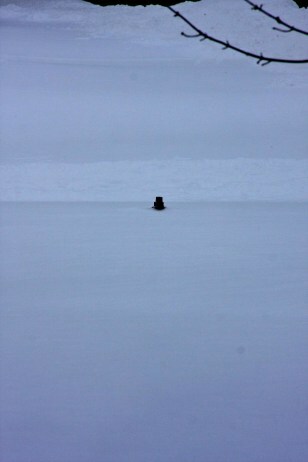 --Submitted by Susan Rusch, Madison, Wis.
That little red tip is the fire hydrant in our front yard in Wauconda in Northeastern Illinois, taken on 2-2-11, at 9am. 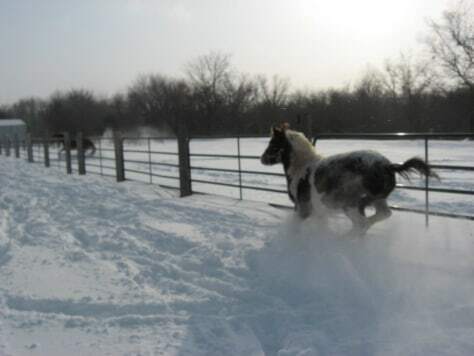 --Submitted by Dayna Fladhammer, Wauconda, Ill. 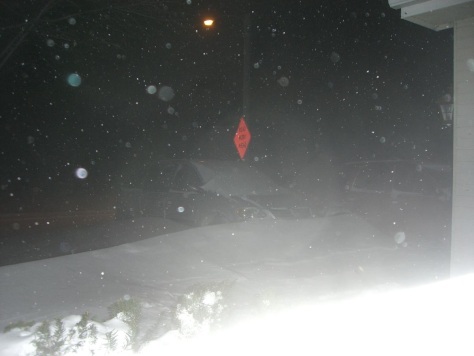 The drifts were over the mailbox BEFORE the plows made their way into our neighborhood. --Submitted by Chris Moehr, Sun Prairie, Wis.
--Submitted by Przemek Garczarczyk, Evanston, Ill. Mother Nature - a work of art! 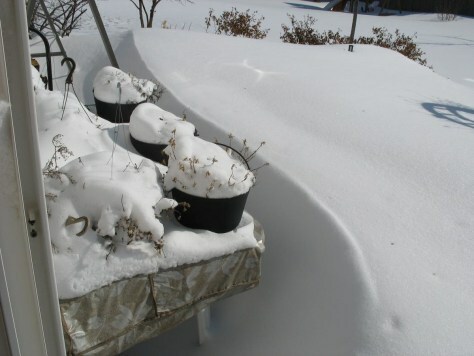 Pictures taken of our patio and front door wreath after the storm - Feb. 2, 2011. 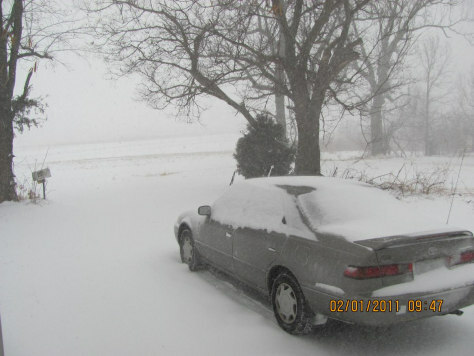 --Submitted by Lura Rogers, Plainfield, Ill.
We don't get much heavy snow here in Bixby, Oklahoma. Usually 3-4 inches, then its gone the next day. I think this is going to be around for awhile. 11 inches. 9 Degrees. 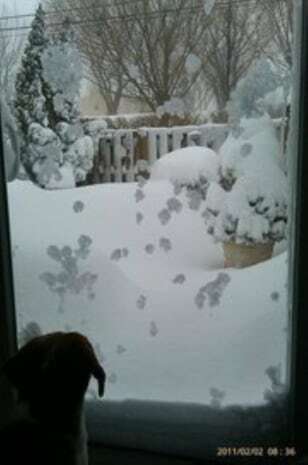 --Submitted by Becky Zavilla, Bixby, Okla. This was taken through a window out back on the deck. The cardinal just sat there for 15 minutes. I noticed that during the day, other birds did this too. The ice is falling constantly and I suspect they have been hit. I am happy to report that they all eventually flew away. 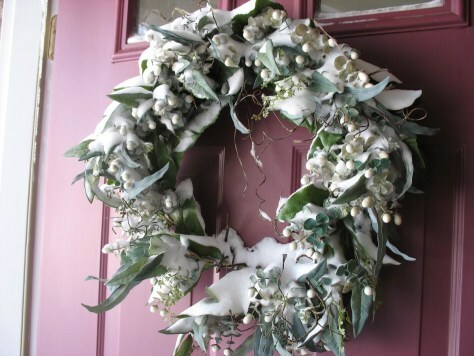 --Submitted by Heather Chalmers, New Hope, Penn. 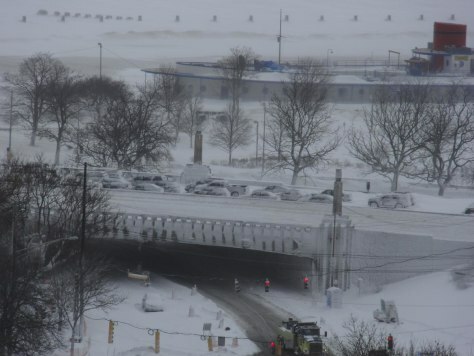 Standing on top of fence at Rogers Beach Park, where snow drifts completely cover the parked cars. We live in Chicago, just a block away from the lake. We tried to get out to see the lake Tuesday night, but the 60 mph winds coming off the lake made it impossible to get close. We went again Wednesday morning, about nine in the morning, and shot these images. 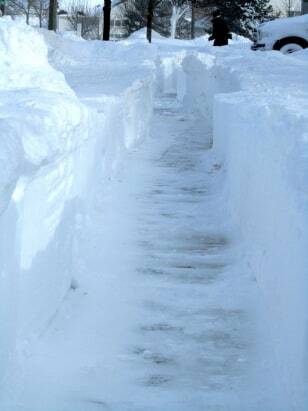 The streets are completely full of drifts, many 5-6 ft high. Chicago SUV Emergency Vehicles on Madison Street, just West of the Loop, 9:30am Feb. 2, 2011. 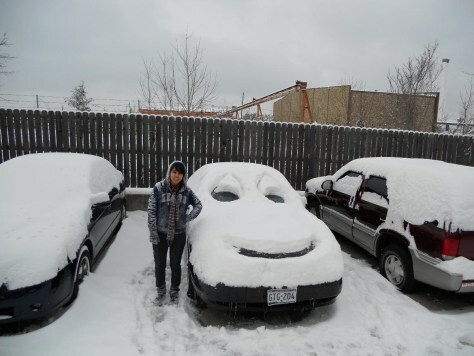 Where'd my car go? 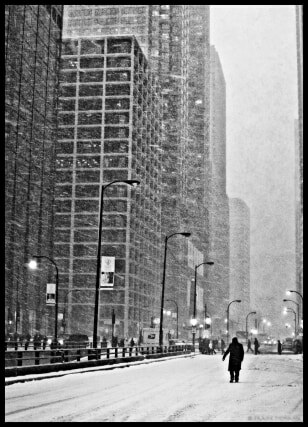 On Monroe Street just west of the Chicago Loop, Feb. 2, 2011, at 9:50am. 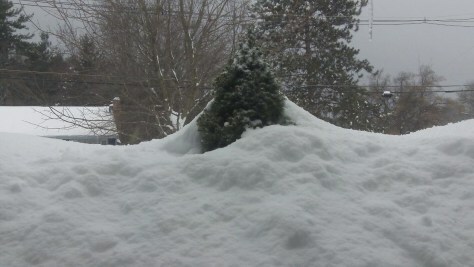 --Submitted by Maura Nolan, Stamford, Conn.
Tree Like Shrub almost completely covered with snow. 21 inches of snow fell since Tuesday. 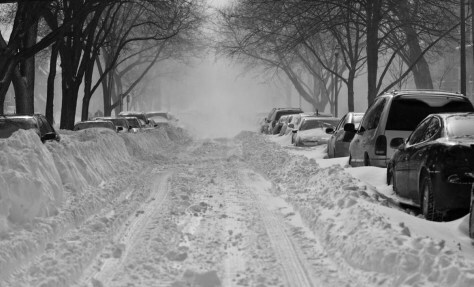 This has been the worst winter since 2005; 5 weeks of snowstorms is too much! 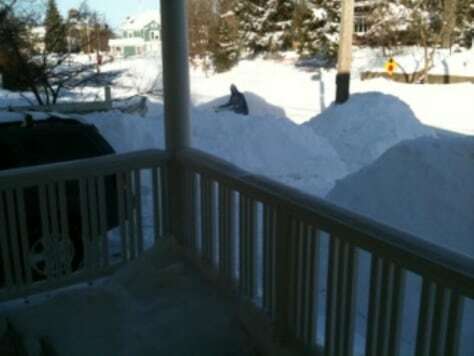 --Submitted by Markus McLaughlin, Hudson, Mass. Main entrance to Midwest Turbine Service in Hartford, Wis., early morning February 2, 2011. 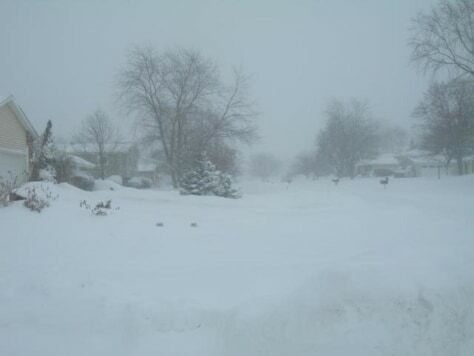 --Submitted by Eric Hein, Hartford, Wis.
Street view outside my house. Taken this morning, at about 8:30am CST. I think it's slowing down now, but who knows? It just might come down some more later this afternoon. Stay safe everyone! 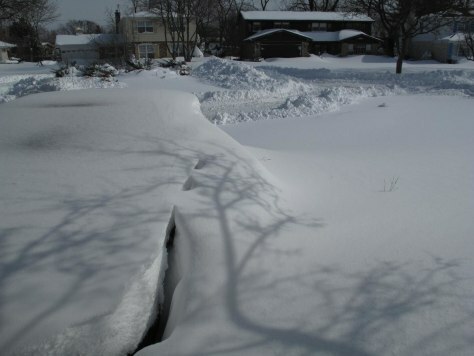 --Submitted by Joy JaymeSuniega, Highland Park, Ill. I want to go for a walk! 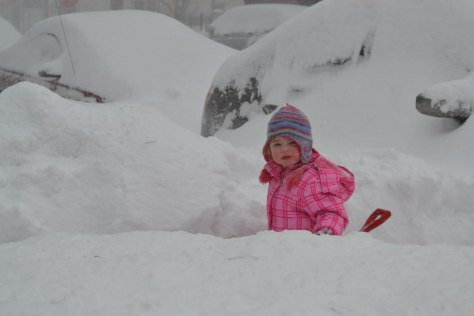 --Submitted by Andrea Smith, Justice, Ill.
Lauren Rothweiler, age 1, helping to clear the snow after the Chicago 2011 snow storm in West Bucktown. Hamlin Ave between 111th and 115th in Chicago. 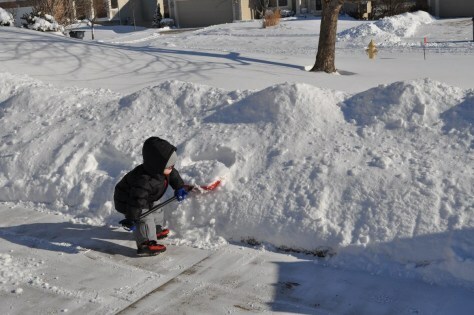 Our 2 1/2 year old son shoveling the mound of snow. 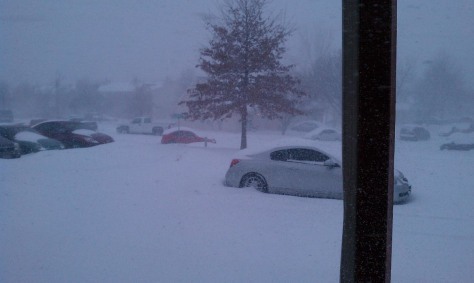 --Submitted by Keri Janda, Olathe, Kan. 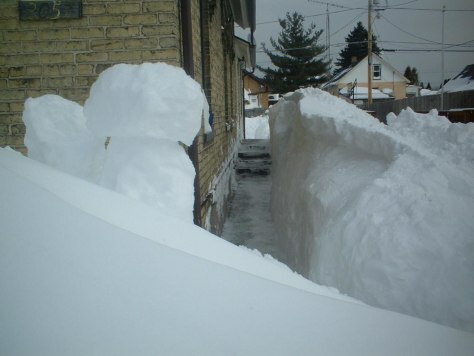 I live in Lyons, Ill., and the 2011 blizzard really brought us a great wave of snow. 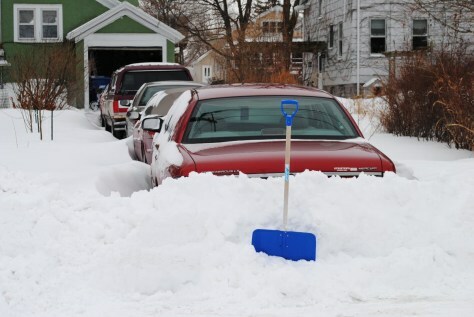 I am worn out after shoveling snow for the past hours. 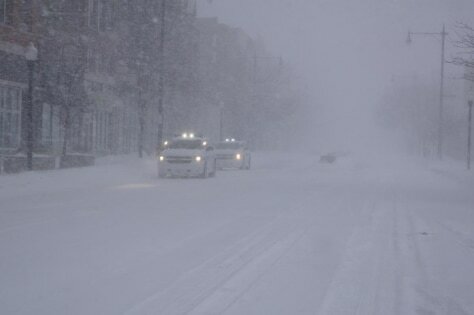 --Submitted by Joshua Cedillo, Lyons, Ill.
Taken 9am in uptown Manhattan, on Ft. Washington Blvd. near the 190 St. stop on the A train and entrance to the Heather Garden in Ft. Tryon Park. 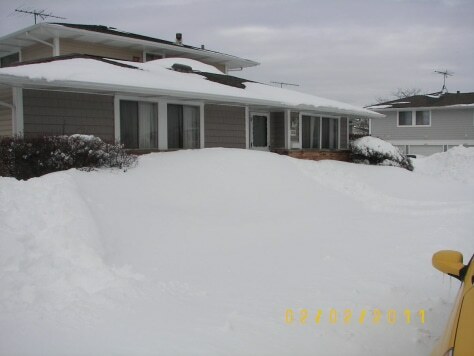 --Submitted by The Cimiaska Family, Pleasant Prairie, Wis. 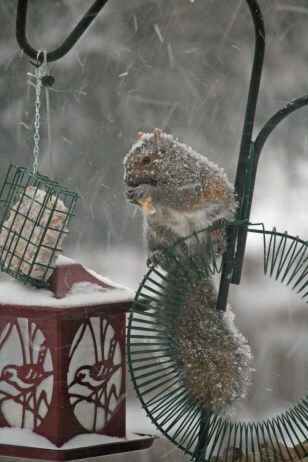 This squirrel has been trying for a long time to get to the peanuts I put on the feeder for Blue Jays. He could not because of the cone baffle. Taking advantage of a huge snow drift under the feeder, he finally reached his goal! 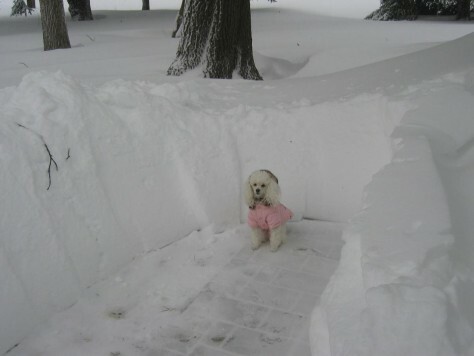 --Submitted by Luc Tabourot, Gurnee, Ill.
Our toy poodle Paris' area had to be shoveled out for her. 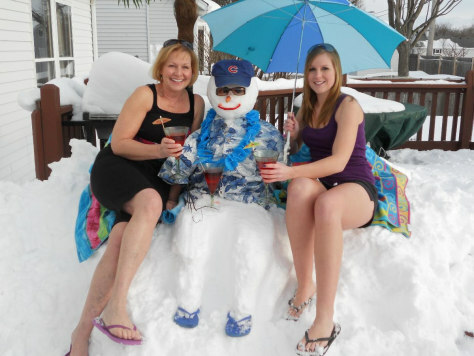 --Submitted by Carolyn Nelson, Schaumburg, Ill. 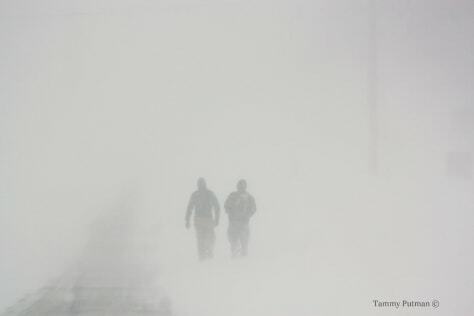 Nothing like a walk in a white out blizzard! --Submitted by Tammy Putman, Lee's Summit, Mo. Someone driving with their head out of the driver's side window. 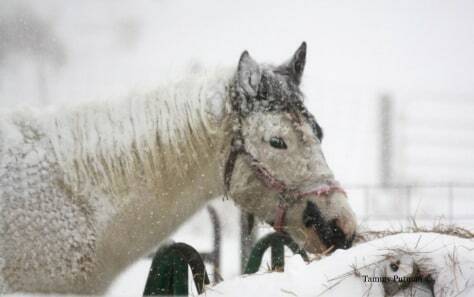 Horse with a blanket of snow. 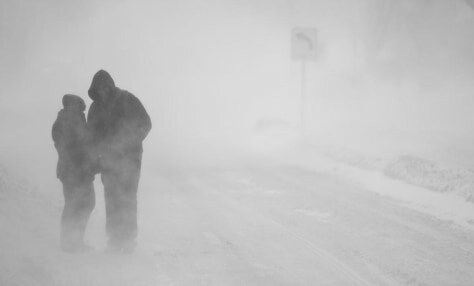 Leaving the streets during the blizzard. Blizzard Birthday Boy Mark Jr., 5 yrs old. --Submitted by Mark Stewart, Waynesville, Mo. 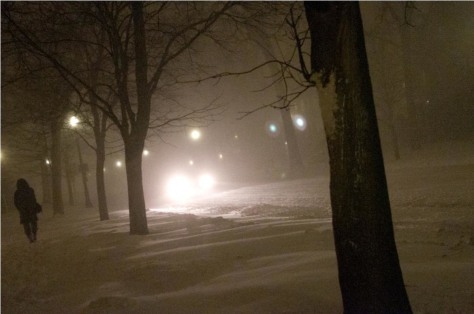 Outside my front door in Brookfield at 3:30am. 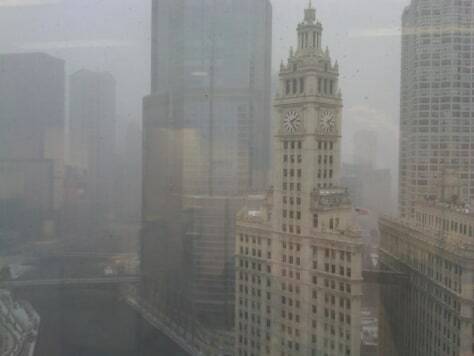 --Submitted by Joel Kordat, Brookfield, Ill.
View from office in Chicago. --Submitted by Krista Boltz, Chicago, Ill.
--Submitted by Lorna Lanphier, Mount Vernon, Mo. Early morning view of today's storm in Tulsa, Okla.! --Submitted by Shanti Thokchom, Tulsa, Okla. 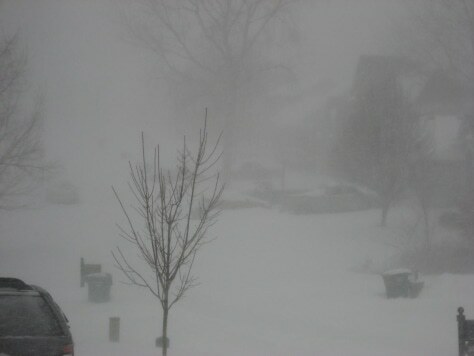 This was taken from my door in Springfield, Mo. I-44 in background. This is near mile marker 67 at approximately 8:45 am CST. --Submitted by Harold W. Miller, Springfield, Mo. The storm has begun in Plainfield, Ill.! 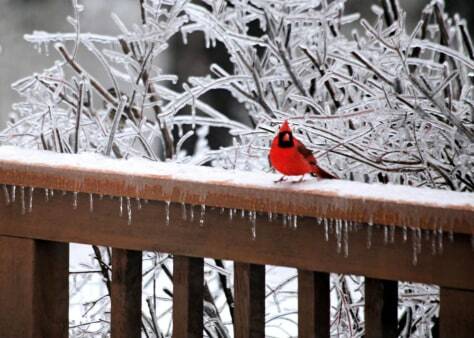 --Submitted by David Schiro, Lockport, Ill. I attend the University of Missouri, Columbia. They have now canceled school two days in a row due to the amount of snow expected, that is very rare! --Submitted by Carrie Cobler, Columbia, Mo. Wind is blowing pretty heavily and that may have affected the overall measurement of five inches. I am inclined to believe we've gotten a bit more than that. 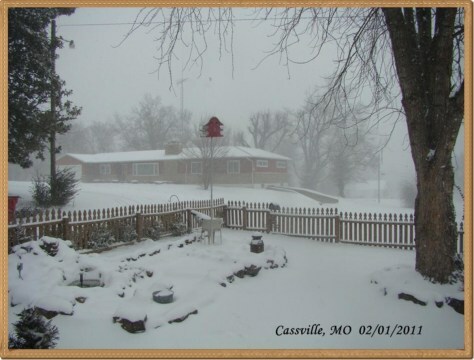 --Submitted by Kristen Crawford, Cassville, Mo. 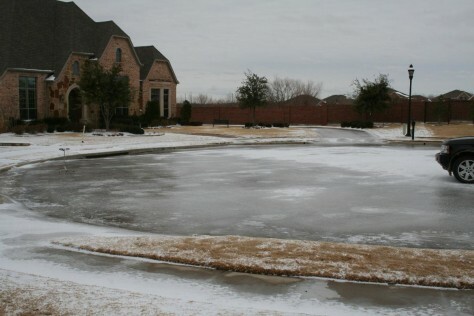 Waking up to an ice storm in Dallas. This is a road in a north Dallas neighborhood. 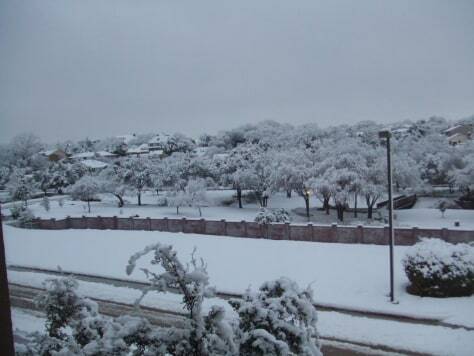 Taken from my home in Dallas at 7:00 AM CST on 2/1/2011. 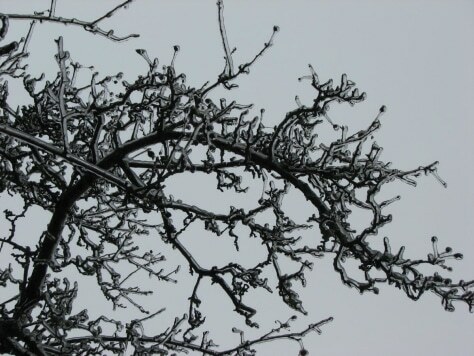 Waking to an ice storm in Dallas is an unusual circumstance. 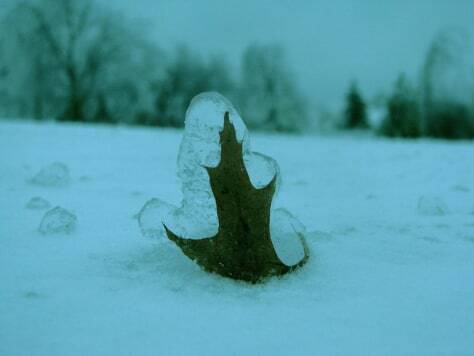 The ground was covered with a sheet of ice. No one on my street dared drive on this. 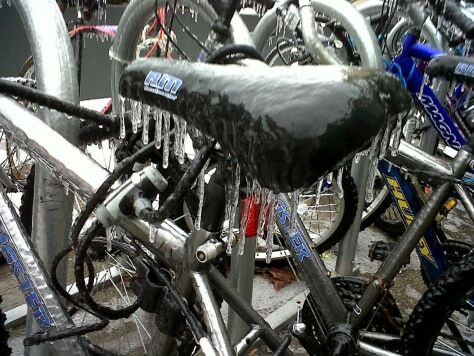 Bikes iced over at Ohio State University. This is in Sedalia, Missouri. 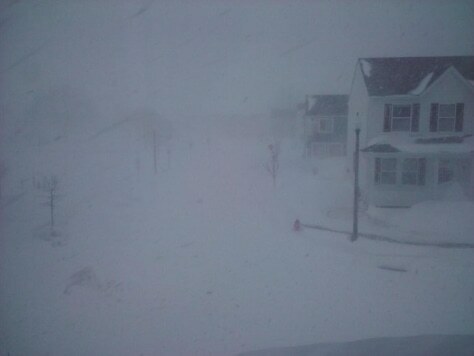 Pretty crazy out there, advice if you can stay home, stay home. We have snow, freezing rain, thunder all rolled into one. 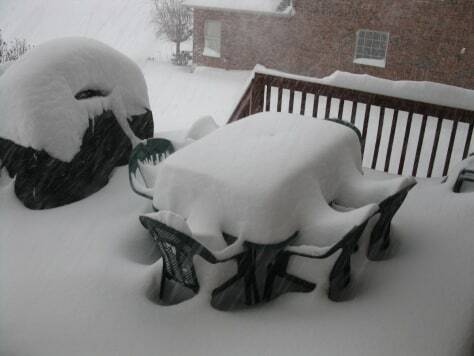 --Submitted by Denise Peterson, Sedalia, Mo. 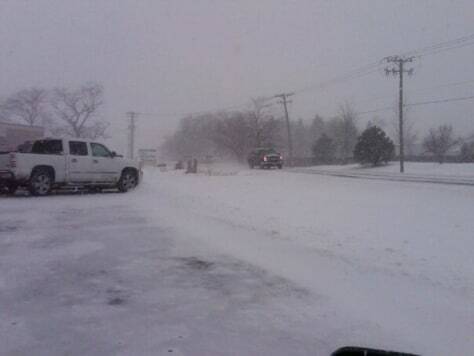 School bus overturns due to icy conditions is Lees Summit, Mo. --Submitted by T. Smith, Summit, Mo. Trying to fight snow off the roof! 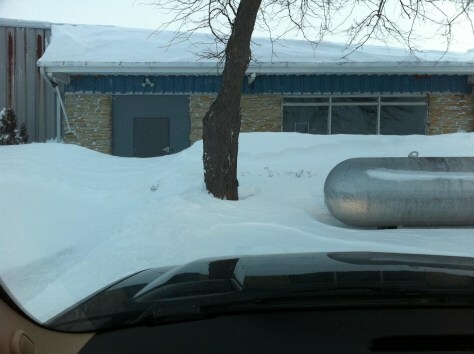 It took a fork truck to get a snow blower on the roof. 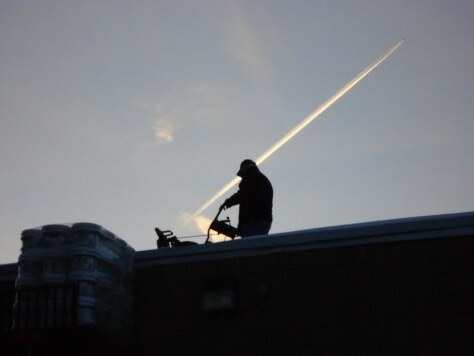 But the roof is clean. 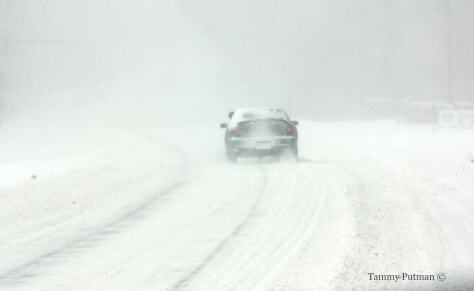 --Submitted by Katie Maguire, Hingham, Mass. 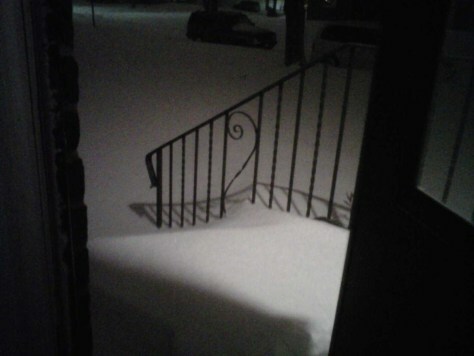 --Submitted by Wanda Roldan, Garden City South, N.Y.